Why Is Roof Repair So Gosh Darn Expensive? Even a simple roof repair can seem needlessly expensive. With no moving parts or complex circuits, roofs give the impression that they should be simple and inexpensive to fix and even replace. However, while much of the work may be fairly straightforward, it still takes expertise and quality materials to finish a sturdy, safe and reliable roof. Materials, labor and insurance costs are the factors that drive roof repair prices through the roof. Here's why. The price of asphalt shingles rose 58 percent from 2008 to 2009, and prices have continued increasing. This is partly due to the rising price of oil, though shingle prices are less likely to drop when the price of oil decreases. The price of asphalt shingles is also affected by increasing demand for highway asphalt, thanks to all the stimulus-related road construction projects. Asphalt shingles are by far the most common roofing material, but other materials also are getting more expensive. Lumber prices are on the rise, and plenty of quality wood is needed for rafters, trusses and other structural supports for your roof. Sheets of high-quality oriented strand board also are needed for the roof deck or sheathing. Even the most basic materials add to the cost. Cheap staples don't cut it on a quality roof job. Galvanized steel roofing nails cost more, but must be used. Even disposal of materials is expensive if your contractor needs to haul away your old, heavy shingles. However, keep in mind that a more expensive but longer-lasting roofing material will save money in the long run. Of course, the best materials are only as good as their installation. A 40-year shingle could warp or leak after just months if improperly fastened. 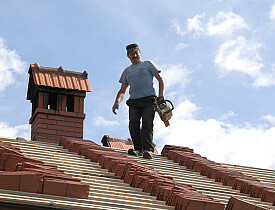 Good roofing work is very precise. Insufficient overhang at the edge of the roof, for example, can lead to water damage. Too much overhang, however, can leave shingles weak and susceptible to other types of damage. Every job requires good workmanship, but some have less dire consequences. A sloppy paint job, for example, is just aesthetically unpleasing. A sloppy roofing job, though, could lead to expensive leaks, poor ventilation, mold and even a hazardous collapse. The best way to research a company's workmanship is by checking references and even inspecting previous jobs, if possible. Just as sloppy workmanship can have dangerous consequences on the roof, accidents on the roof can also be expensive - especially if you are liable. The lowest bidder likely doesn't pony up for comprehensive liability and workers' compensation insurance. When you hire a roofing contractor, Be sure to get proof of the proper insurance -- as well as a current license. Help! A Raccoon Chewed Through My Soffit!